On Tuesday, President Barack Obama honored the legislation that helped pave his path to the White House. 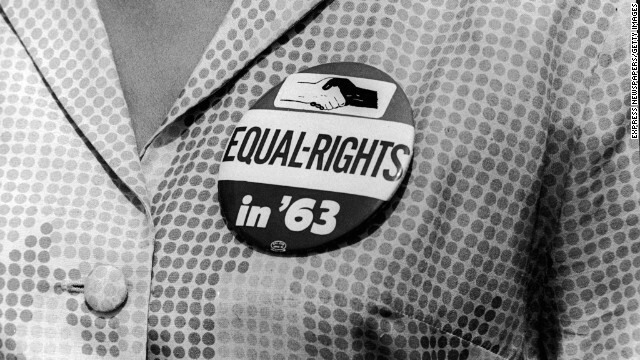 Fifty years ago, the 1964 Civil Rights Act was signed into law. It made it illegal to discriminate on the basis of race, gender, or national origin. The act outlawed for the first time the segregation of whites and minorities at lunch counters, on buses, and in other public places. It also notably gave women legal recourse for workplace gender discrimination, giving American women a metaphorical “hammer” which they could wield to shatter the glass ceiling. Combating inequality has been a core tenet of Obama’s second term, reflected in his efforts to narrow the gap between rich and poor, and the wage difference between men and women. Will the Act’s promise of equality for all come into play during this year’s midterm elections? The Republican party has been frank about courting the female and minority vote, demographics that overwhelmingly voted for Obama in 2008 and 2012. Last month marked one year since the party’s exhaustive “Growth and Opportunity Project,” a comprehensive examination of lessons learned from the GOP’s 2012 electoral defeats, was released by RNC chairman Reince Priebus. Colloquially called the GOP “autopsy,” the 110-page report described the task of engaging women and minorities and “champion[ing] comprehensive immigration reform” as exigent: “for if we do not,” the report cautions, “our Party’s appeal will continue to shrink to its core constituencies only.” Republicans overall have roundly failed to heed the autopsy recommendations, continuing to block immigration reform and perpetuating the “War on Women” by working to restrict women’s reproductive rights. Representative Paul Ryan’s recent remarks about “generations of [inner city] men not even thinking about working” were perceived as racially charged, and only alienated that crucial demographic that the report urged the party to win over. Just last week, Nancy Pelosi expressed her belief that racial prejudice was at the heart of Republicans’ derailing immigration reform, suggesting that the GOP would be less reluctant to act on immigration legislation if most undocumented immigrants were not from Latin America, but rather a place like Ireland, “I think race has something to do with the fact that they're not bringing up an immigration bill," she said last Thursday, adding “I've heard [Republicans] say to the Irish, 'If it was just you, this would be easy.'" This past week also marked another occasion that laid bare another failure to fulfill the provisions of the Civil Rights Act. Tuesday was also Equal Pay Day, the point on the 2014 calendar to which the average female worker must work to match the average man's 2013 pay. Women still make on average 77 cents for every dollar earned by a man, and Tuesday brings us 23% into 2014. Senate Democrats used the occasion to dust off the Paycheck Fairness Act, but it failed for mostly partisan reasons, for the third time. Republicans countered with findings that women on the White House payroll make on average 88 cents to a male staffer’s dollar. White House press secretary Jay Carney’s rebuttal, that at least the White House was doing better than the “public at large” seemed tone-deaf. In his speech Thursday, Obama warned against succumbing to cynicism, acknowledging that there have been failures. But he described the Civil Rights Act as making possible his own accession to the White House. Indeed, it was not even fifty years after the Act first made segregation illegal that the same nation, awarded Obama America’s greatest political prize–the Presidency. Obama acknowledged the progress achieved by the march towards equality. "Because of the Civil Rights movement, [...] new doors of opportunity and education swung open for everybody," he said. "They swung open for you, and they swung open for me. And that's why I'm standing here today - because of those efforts, because of that legacy."